Figure 28.6 illustrates the evolutionary relationships among the different species of the genus Naso in the form of a phylogenetic tree based on sequences from mitochondrial and nuclear genes. Members of the genus display a variety of behaviours including pelagic foraging in the water column, benthic foraging over the reef surface and a mixture of pelagic and benthic foraging modes. Species that swim slowly in open water develop extended frontal horns, fast swimming pelagic foragers have a tuna-like morphology. 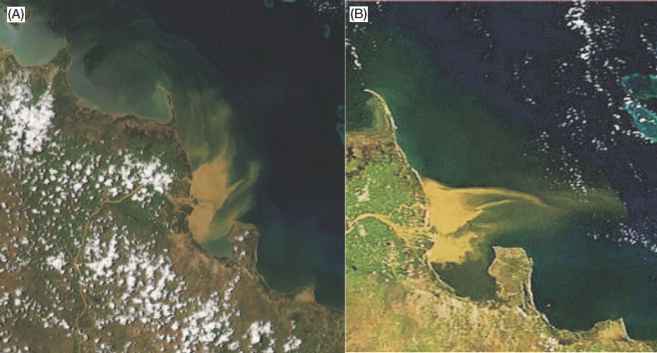 Different foraging modes are associated with different feeding patterns: macroplankton, benthic animal material, brown algae or mixtures of green and red algae. Some species feed on both planktonic and benthic animals; others feed on algae and plankton. The phylogenetic reconstruction shows that the two most speciose evolutionary groupings or clades (1 and 2) each show examples of the different foraging modes. The distinctive morphologies such as frontal horns and tuna-like body shapes have developed independently in the different clades. The ancestral groups are represented by small pelagic species in the subgenus Axinurus. The genus is a relatively ancient widely distributed group of reef fishes with the distribution ranges: IPO, Indo-Pacific; PO, Pacific; IO, Indian Ocean, WIO, West Indian Ocean indicated. The numbers represent the robustness of the tree structure using Bayesian, MP and ML analyses. Further details are available in Klanten et al. (2004). Molecular Phylogenetics and Evolution 32, 221-235.
i i i i i i and with caudal knives (surgeonfishes) occur very infrequently in the stomach contents. There are numerous different types of predatory fishes including pelagic species such as mackerels (Scombridae) and large trevallies (Carangidae) but the dominant predators on coral reefs are usually groupers. These are dominated by four genera, Epinephelus, Cephalopholis, Plectropomus and Variola and may be partitioned into ecological and foraging groupings. The largest genus is Epinephelus with 27 species recorded from the GBR followed by Cephalopholis, 10; Plectropomus, five and Variola, two. Epinephelus is notable in that the species cover a very wide size range from E. lanceolatus, which reaches 2.5 m total length (TL), to small cryptic species such as E. merra at 0.25 m TL. The genus may be ecologically subdivided by size, with large species between 0.6-2.0 m TL often being mobile species but usually associated with bottom cover. Smaller species are more numerous than the larger species, with GBR grouper assemblages being dominated by fish 15-25 cm TL. Size is related to foraging activities. Small groupers, including members of the genus Cephalopholis, small species of Epinephelus and juveniles of the larger species are invariably cryptic, associated with the shelter of coral growths and debris. The larger species of Epinephelus are more mobile and may move considerable distances when foraging, but are strongly associated with complex reef structures and usually seek shelter when disturbed. Members of the genus are usually ambush predators preying on other reef fish. In contrast to the genera Cephalopholis and Epinephelus, members of the other two genera, Plec-tropomus and Variola, have a roving habit and usually forage above the substratum, especially on reef fronts, slopes and deeper reef bases. For this reason, they are more visible to the observer than other groupers. There are two unifying features of groupers. First, juveniles are invariably secretive and associated with areas of high cover. For this reason it is difficult to estimate recruitment patterns in reef groupers and to obtain information on the early growth stages. Second, members of this family frequently aggregate to spawn, with some species of Epinephelus reaching very high local densities at spawning sites. Other genera such as Plectropomus also form spawning aggregations, but with numerous local groups with relatively low numbers of fish. The GBR grouper fauna has some unusual features. Most reef areas are dominated by smaller cryptic species with the larger mobile species being comparatively rare, even in areas protected from fishing. Consequently, observers see few groupers during normal activities. For example, the dominant groupers on relatively undisturbed reefs in the southern Seychelles were Cephalopholis urodeta and Epinephelus fasciatus, two small species that made up 70% of the grouper fauna. Larger species, such as E. polyphekadion and E. fuscogut-tatus, occurred at less than one individual per 1000 m2. Although four small species of Cephalopholis made up 47% of the GBR grouper fauna, two species of Plectro-pomus, P. leopardus and P. laevis, made up 33% of the fauna. The presence of these large, actively foraging predators on reef crests and reef fronts are a unique feature of the GBR predator fauna. By comparison, this genus was very rare in the southern Seychelles. This is not a reflection of fishing as other groupers of great commercial importance were recorded in high numbers from the monitoring sites. This simply reflects the natural distribution of Plectropomus, a genus confined mainly to the south-west Pacific and the Indo-Australian region. The ecological equivalent was Variola louti, a species that shows a similar above-bottom foraging habit to Plectropomus, although it made up only 6% of the serranid fauna. The most abundant populations of Plectropomus occur on the Australian plate and especially on the north-eastern Australian coasts and reefs where they also support extensive fisheries. This high concentration of roving and highly visible predators is very much an Australian phenomenon. Predation is intense on coral reefs and the influence of predators such as groupers on reef fishes may be manifested in behavioural and morphological responses in the prey species. Many reef fishes have evolved colour patterns and behaviours as a means of avoiding predation, or in some cases to enhance their ability as predators. The most common way of avoiding predation is through protective resemblance or camouflage, where the fish closely resembles a part of a substratum, a plant, or a sedentary animal such as a sponge or soft coral to avoid predation (Fig. 28.7; Box 28.3).